What if you could experience the internet by using a screen-less and physical interface? The Internet Phone makes the intangible processes of the internet tangible. You can access websites with the nostalgic interface of a rotary phone. Look up the IP address of the website you want to call in a special cyber directory, dial the twelve digit IP address using the rotary, and wait for your website to be read out loud in the receiver. And if you are feeling adventurous, you can enhance your experience with four different mode tokens – article, developer, incognito, and history. The Internet Phone leverages existing telephone behaviours to demystify the invisible workings of the internet. Each step in the user experience is comparable to the process that a browser takes when retrieving a website. Looking up the IP addresses in a phone book is similar to how a browser gets an IP address from DNS (Domain Name System) directories. Dialing the twelve digits and waiting for the phone to retrieve the HTML content mimic how a browser requests data from servers. The voice-to-speech reading of the website is comparable to how a browser translates HTML and CSS code into human understandable content. The mode tokens mimic the different methods that a browser can interact with the internet. 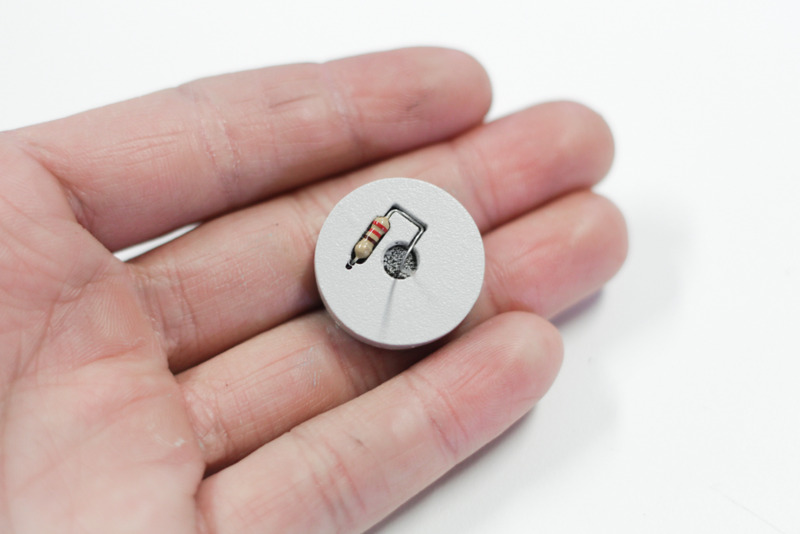 To activate a mode, unscrew the microphone cap in the receiver, and place a mode token inside. In the article mode, the phone formats a website as an article and omits unimportant content. In developer mode, the phone reads the entire HTML content of a website. In the incognito mode, your browsing become anonymous. And in the history token mode, the phone recalls the last five visited webpages. With The Internet Phone, you can experience the familiar activity of surfing the web in a novel and physical way. 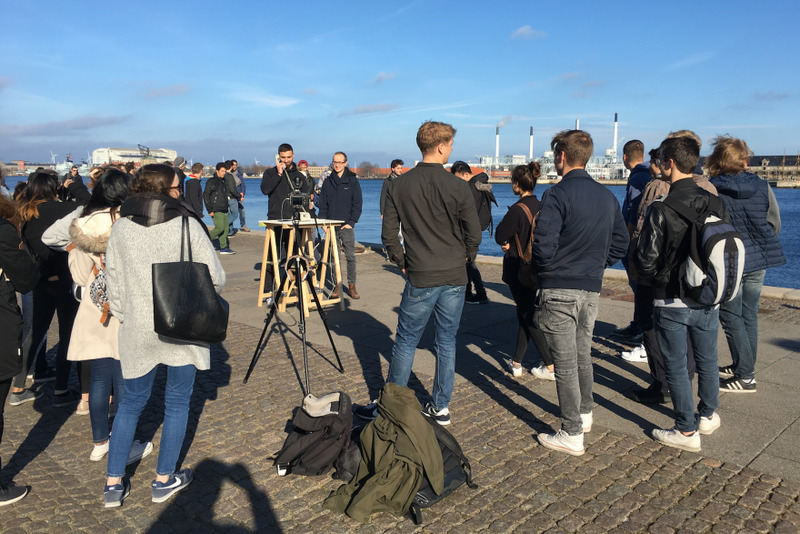 The Internet Phone was exhibited at the Copenhagen Institute of Interaction design as well as the Langelinie harbour in Copenhagen. People of all ages experienced The Internet Phone. The reactions went from astonishment to amusement. They walked away curious and inspired, having been exposed to the hidden mechanics of the internet they use every day. 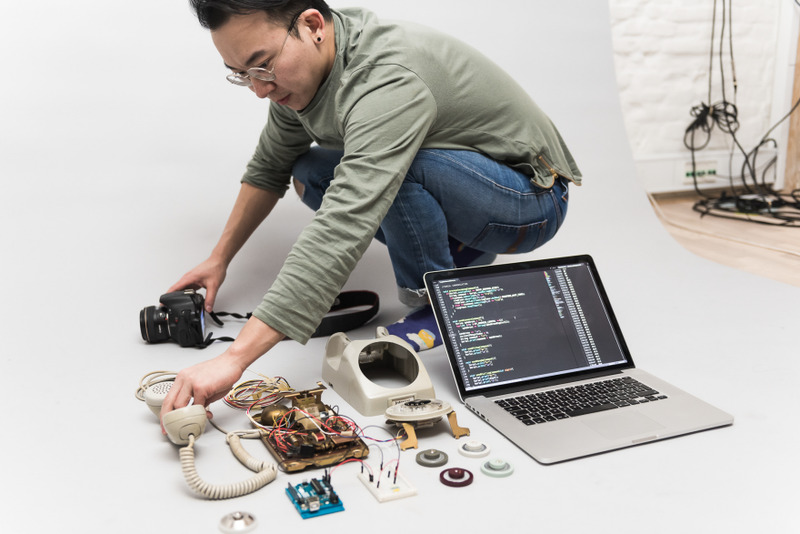 The Internet Phone is developed by students in the Physical Computer course taught by Massimo Banzi, Dario Buzzini, and Ankitt Modi at the Copenhagen Institute of Interaction Design. For most of us the internet is a mysterious black box that lets us read the news, watch videos or browse social media feeds. But how does the internet work behind the scenes? Most our interaction with the internet is through an intangible browser. What if we can make the internet experience tangible and understandable? Initially, we experimented with routers as the metaphor for the internet. We iterated on new ways to interact with these dull and neglected devices. But we quickly realised that routers are too abstract and too complicated. Looking for another device suitable to represent the internet we came across an old rotary phone. We decided to extend the metaphor of the internet to the phone and repurpose its interface. 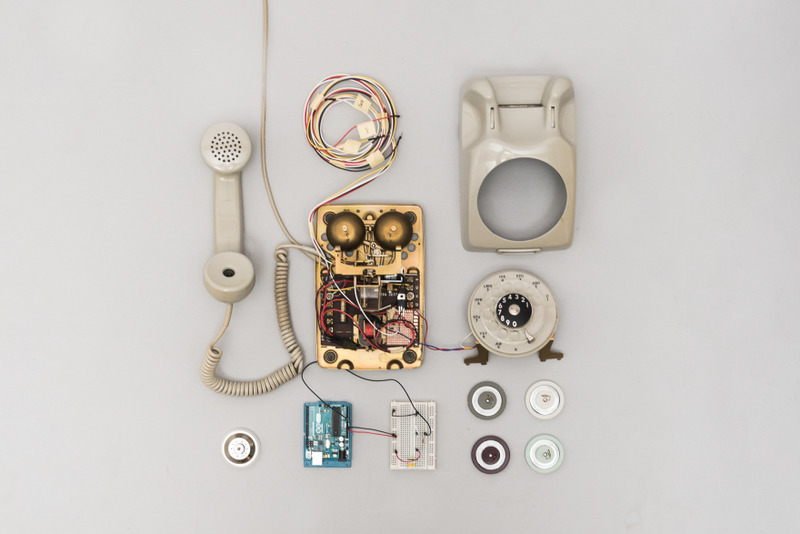 We saw the potential in using the rotary phone as a metaphor and interface for the internet. The rotary phone is an iconic piece of hardware. It has clear and understandable affordances. 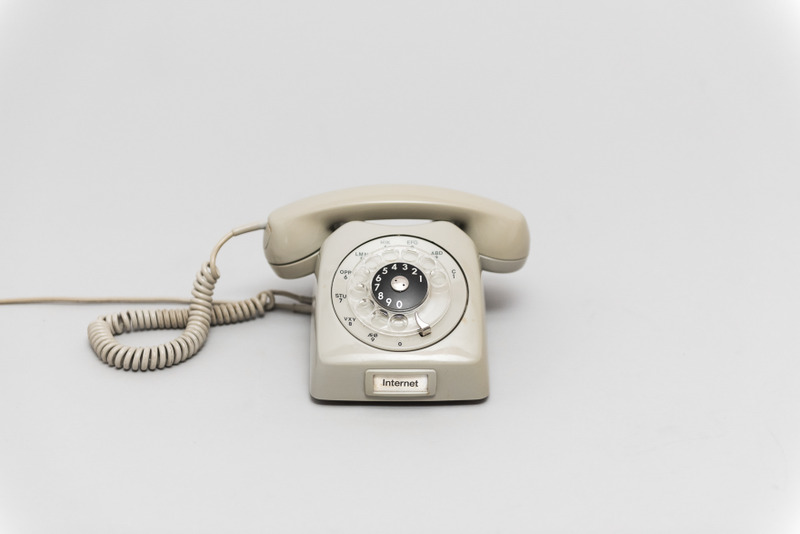 With the familiar user experience of the rotary phone, we can demystify the complex processes behind the internet. We decided to restrict ourselves to only use the existing affordances of the rotary phone. We connected an Arduino micro-controller using the original circuitry of the phone. We wired up the lever, the receiver, the bell and the dial. Theses physical interfaces became the basic inputs and outputs. 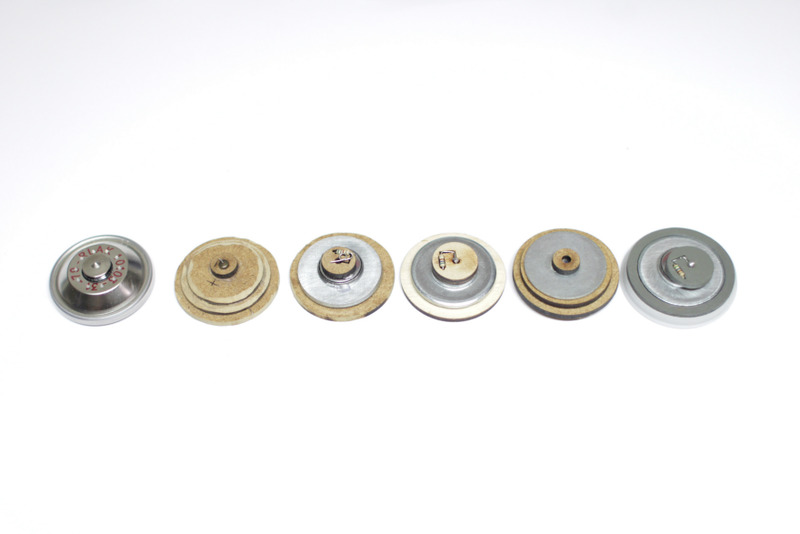 Rotary phones have replaceable speaker and microphone components housed in the ends of the receiver. We used this opportunity to create an additional layer of physical interaction. We created four mode tokens: article, developer, incognito and history. Each token represents a different browsing mode that you might find on popular web browsers. First, you have to look up an IP address to call. 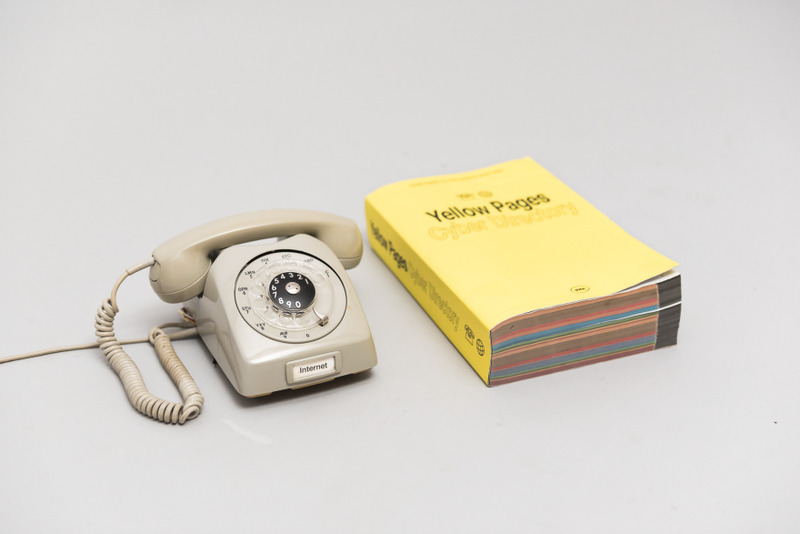 We made a mock telephone book populated with working IP addresses. When you pick up the receiver, you are greeted by a computer generated voice that says: "Welcome to the internet. 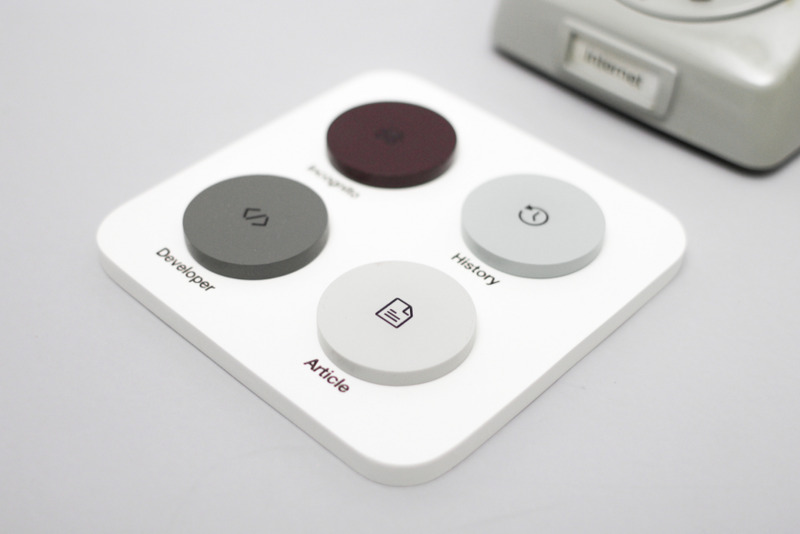 Dial for websites." Then you dial your twelve digit IP address and wait for the connection. To highlight the loading process, we randomly programmed The Internet Phone to say: "Your page is loading, please hang up. We will call you back". In a few seconds, the phone will ring. When you pick up receiver the voice says: "Your page is loaded", and reads out the content of the webpage. To continue, you can either hang up and call again, or try one of the mode tokens. You insert the mode token by unscrewing the lower microphone cap. Once the token is inserted, the voice will tell you the current mode, and prompt you to dial 1 to confirm. The article mode only reads out the articles from each website. The developer mode reads out all of the HTML. The incognito mode makes your browsing anonymous. And the history mode recalls the last five visited webpages. 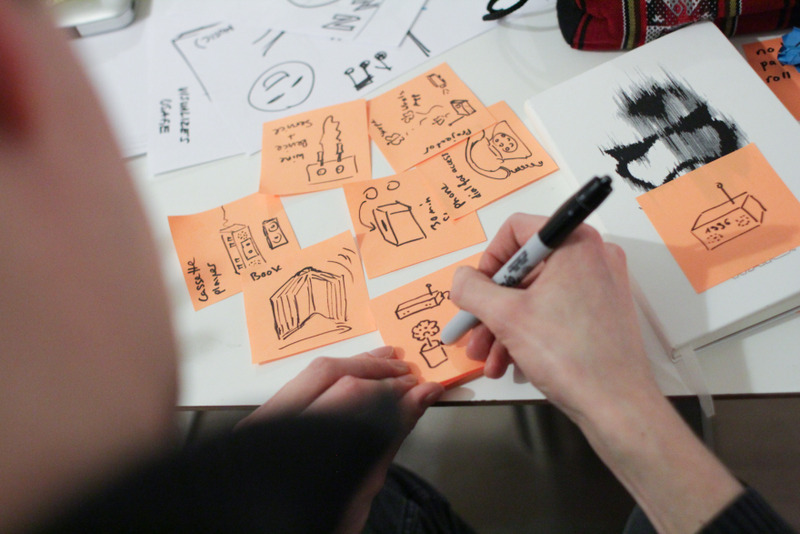 One of the biggest learnings from this project is designing the user experience. The classic telephone interface seems simple and straightforward. But when we switch the context, the user experience becomes complex. What happens if the website does not load? What if the you dial the wrong IP address? Should you be greeted when you pick up the receiver, or when your page is loaded? We had many testing sessions to iterate on these little moments. As a result, we implemented several small but important micro-interactions. For example, the greeting message has a four second delay after you pick up the receiver. Four seconds is the average amount of time a user takes to bring the receiver to their ear. When you make a wrong dial and do not hang up for more than 5 seconds, a error tone is played. First, we needed a list of IP addresses to populate a cyber directory. However, modern websites are usually hosted on shared host servers instead of private servers. Websites hosted on shared servers are not able to be called with an IP address. This is similar to calling a company that has a common phone number for multiple employees. We had to manually look up websites that are hosted on private servers. Only these websites can be accessed by their IP address. 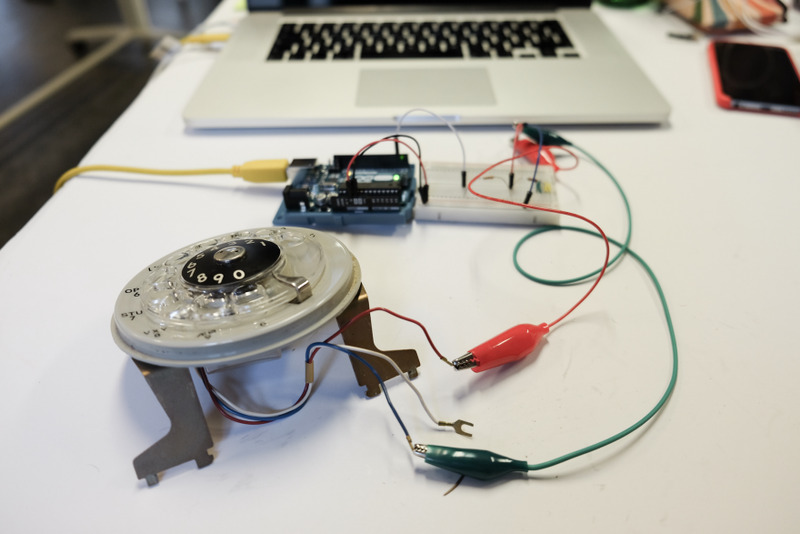 The Arduino sketch records the input from the rotary wheel and sends a string to the java/processing sketch. The processing sketch reformats the string to an IP address and uses the JSoup Java library to retrieve raw HTML data. Then we use various functions to parse out the natural language parts. We feed that data to a speech synthesizer using the Minim processing library. The synthesizer reads the text and sends the audio signal through the computer's audio jack to the receiver. The article, developer, history and incognito token each have a different resistor. When the resistor makes contact with the two exposed metal conductors in the microphone cavity of the receiver, the Arduino sends a unique command to the processing sketch to switch the mode. In the article mode, we only parse sections with a <body> or <article> tag. In developer mode, we read out the bare HTML content. In the history mode, we retrieve the last couple of IP addresses. In the incognito mode, the IP address is not recorded, and a filter is applied to the text-to-speech function. Webpages in the incognito mode is read out in a whisper like tone. 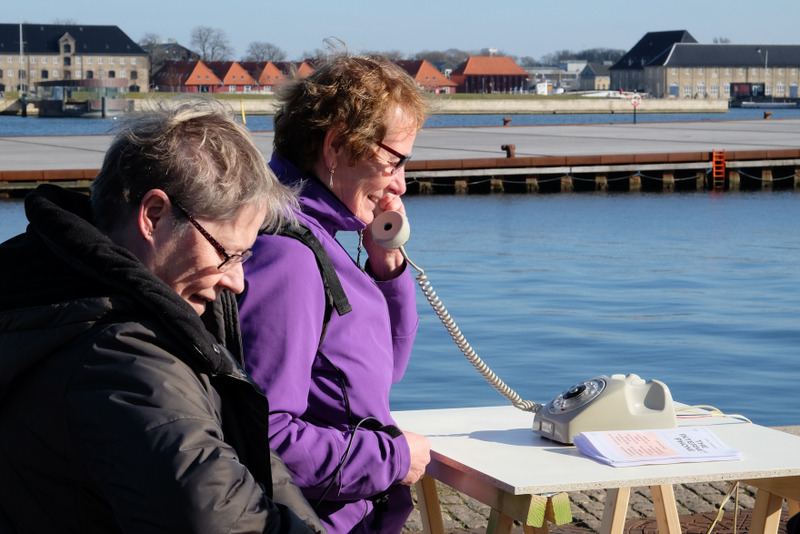 The Internet Phone was exhibited at the Copenhagen Institute of Interaction design as well as the harbour of Langelinie, Copenhagen. People of all ages and walks of life experienced The Internet Phone. The reactions went from astonishment to amusement. Seniors usually reflected on the nostalgic factor of the phone and expresses joy in discovering a new use. Adolescents were very inspired by the unconventional approach of accessing the internet compared to the elaborate social media and messaging apps they are using on a daily basis.